A Canadian in Ireland – Doesn't have the ring of "An American in Paris" but what can you do? This blog has been migrated from My Opera prior to that site’s closure. On the blog at least. Ireland itself is another story. And this ridiculous mild weather looks to continue into next week. At this rate the only White Christmas we’ll see is on the telly. Not that I wouldn’t mind seeing Bing and Danny. And I’ve no decorations up yet either. That will likely be a project for this weekend. BTW, if you want to use this theme on your own blog you can get it here. Our little village had its second annual Christmas concert over the weekend. Though there’s a lot of work, and more than a little stress, it’s all worth it in the end. And it’s really wonderful how everyone will pitch in. We also had the school children doing various pieces – a nativity play, songs, skits – dancers from the area schools – both modern and Irish – local musicians. The drama group also put on a one-act play. So a full evening of entertainment. The patient is not impressed. This is Willy, fresh home from the vet after being spayed. She was a bit sore last night, and confused. She kept growling at this invisible pest that was nipping at her side. 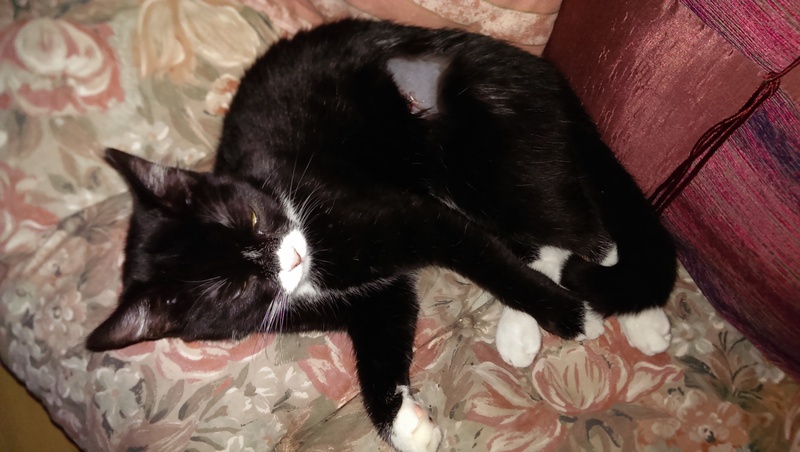 Willy arrived at the back door about six months ago – tiny, wet, crying, shivering, and with a bad dose of cat ‘flu that had got into her eye and caused an ulcer. Hence the name – Willy Winkie. But after some TLC, plus antibiotics and eye-drops, she made a full recovery. Other than that there’s not much to say. She’s a typical kitten – full of devilment, but cute enough to get away with anything. Our last one before My Opera closes.